Transforming London's iconic landmarks with extraordinary light installations. 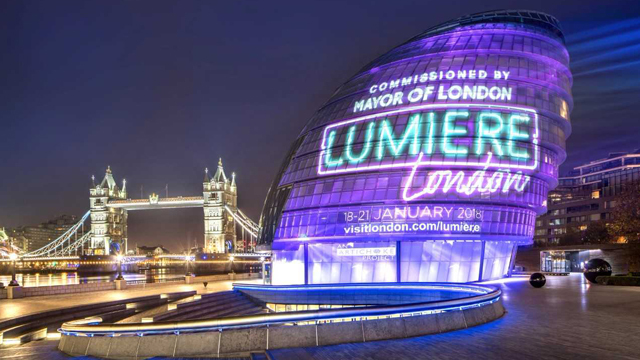 Following its inaugural success in 2016, Lumiere London returned with four spectacular nights during January 2018. London’s iconic architecture and streets were transformed into a dazzling nocturnal art exhibition by the world’s most exciting artists; showcasing 54 incredible installations over an expanded footprint across London. Working in partnership with the GLA and Lumiere London’s producers Artichoke, we helped progress the concept and maintain momentum behind the festival. We (London & Partners) were the lead media partner for Lumiere London and visitlondon.com/lumiere the digital home of the event. We also provided further support with fundraising, communications and international PR to help position the event as London’s next big thing.